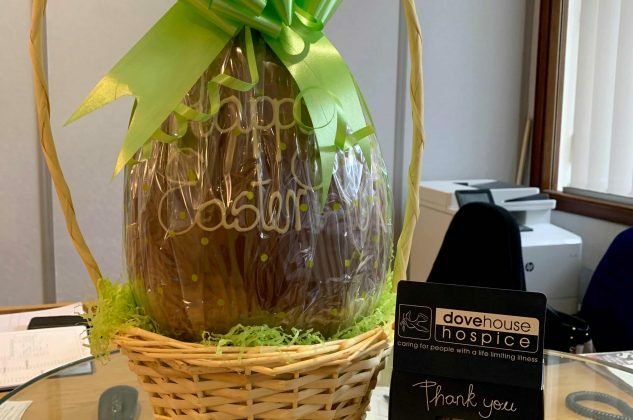 We are raising money for Dove House Hospice by selling raffle tickets to win a wonderful Easter Egg! Tickets are available from our Hull office main reception at £1 each with all the money going to this great local charity. Dove House Hospice is a charity providing excellent care for people in the local community with life limiting illnesses. They are specialists in palliative care, which is the total care of patients whose illness is no longer curable and for whom the goal must be quality of life. Their services are available to anyone over the age of eighteen years who has an illness which can no longer be cured. Care is provided for patients with cancer, neurological illnesses, heart diseases, respiratory diseases, HIV/AIDS and many other illnesses. Their care incorporates physical, social, psychological and spiritual support delivered by a multi-professional team who embrace the family and significant others throughout the patient’s illness. Dove House Hospice is maintained by some Government funding but the majority of our running costs is raised in the local community and so there is no charge for any of our services.